So Jonah is rebelling, but God wants to get his attention. The storm is so violent that even the seasoned sailors are afraid. They're crying out to their gods, but Jonah is sleeping. Some people have suggested that depression can be anger without energy. We lock up our feelings in a box and the box gets heavier and heavier to carry around until we withdraw and retreat into sleep and inactivity to avoid the elephant in the room. The captain's amazement makes it clear that Jonah's behaviour is unusual and bizarre. Hundreds of year's later, frightened disciples would wake Jesus who also slept in the storm. But Jesus isn't suffering from depressed denial - He's not hiding from God - He is secure in the love and protection of the Father - He is in God's will and following God's plan. Sometimes they frighten us and cause us to pray. Sometimes we sleep because we are utterly secure in God's love. Sometimes we sleep because we are angry and upset and don't want to face our challenges. Jonah's anger has led him to go in the opposite direction of what he was called to. In his disillusionment he is heading for the place where "God is not." And now in ongoing denial he sleeps - ignoring the danger the storm holds - both for him and the others on the boat. If you see something of yourself in Jonah today, don't stay isolated like he did. Reach out, talk to a wise counsellor, get help. You'll be glad you did. I am amazed at this verse. If Jonah didn't want to go to Nineveh, surely all he had to do was ignore God's message? But Jonah doesn't only reject the message, he rejects to Giver of the message. If God is a God who might include the Gentiles in His mercy then Jonah wanted nothing to do with Him! Twice we're told that he wants to escape God: "Jonah ran away from the Lord" and that he had decided to "flee from the Lord." Tarshish is as far West from Palestine as Nineveh is East from Palestine. "Tarshish" was also known as the place "where God is not." He boards a ship. The Israelites were not a sea-faring nation. The Old Testament speaks of Leviathan, the sea monster of the deep. The Sea of Galilee was the limit of their sea-adventurers. The Mediterranean was too big and scary. He pays for his fare. These actions are quite a statement of rejection and evidence of fairly significant tantrum or prophetic pout. "If that's the kind of God You are then I am not only going to ignore you, but I'm going to head in the opposite direction, even when that's way out of my comfort zone and even if I have to pay good money to go that way." When we put God in a box which carefully defines what He can and can't do, we can expect that He will break out of that box. And God almost always confounds our boxes with the unexpectedness and magnitude His mercy. ("How can God forgive him/her?") This creates a crisis for us and our typical reaction is similar to Jonah's. We stop going to church. We don't read our Bibles. We rebel. Maybe Jonah had reason to hate the Assyrian Ninevites. Maybe they had killed someone important to him. Whatever it was, Jonah couldn't stomach the idea of God being merciful to them. He not only ignores the message. He rebels against the Message-Giver. In 1956 Jim Elliot went as a missionary to the Auca tribe in South America. Shortly afterward he was murdered by the people he had come to share God's love with. A few years later his widow, Elizabeth, stunned the world when she went to live among people who had murdered her husband. She spent years in their midst proclaiming the love and forgiveness of God. I wonder who we are more like, Jonah or Elizabeth Elliot? Jonah had heard the word of the Lord before. In fact, the last time he heard God's voice, it was a promise that Israel's boundaries would be extended and this prophecy was fulfilled by king Jeroboam. It continues to be a wonderful thing that God speaks to and through His people. God guides and leads people in unfolding His plan in the world and we have the amazing privilege of being His co-workers. But Jonah rebelled against this instruction from God. Had past success had hardened Jonah's heart with arrogant pride? Or did Jonah have a problem with Nineveh? Nineveh was some 500 miles from Jonah's home town. It was the capital of Assyria. The Assyrians would later destroy the Northern Kingdom of Israel in 721BC and fall to the Babylonians in 612BC. The prophet Nahum prophesies the ultimate destruction of the Assyrians and Nineveh. Nineveh represented power and oppression. It was the home of the enemy. And now Jonah was to go there. And, judging by his past success, he might be successful again. And if he was successful in his preaching, then Nineveh (a city full of uncircumcised heathens) might repent. He didn't want to leave the comfort of his home town and go among the "heathens" in Nineveh. He didn't want to be associated with the gentiles. He didn't want his preaching to succeed and bring them to repentance. We're going to spend a little while on the book of Jonah. There is much controversy over this book: Did Jonah really get swallowed by a fish and live to tell the tale? Did Nineveh really respond in a city-wide act of repentance? Is there really a fish that could swallow someone and spit them up later? Shouldn't we just treat this story as an allegorical satire? But then why does Jesus parallel His three days in the tomb to Jonah's time in the whale's belly thus lending factuality to the story? Let me say at the outset that I am perfectly comfortable to believe that the God who created the entire universe and who raised His Son from the dead is completely capable of providing a fishy submarine for a stubborn prophet. I think the debates about whether Jonah is allegory or fact miss the point entirely. The bottom line is that there are great truths conveyed by the account - and these truths are bigger than Jonah, the fish or Ninevah. I'm going to deal with the text as it stands and take it at face value. This, I think, was the author's intention. Jonah, son of Amittai lived in the 8th Century BC. He is acknowledged briefly in 2Kings14:25 as one who spoke the word of the Lord. However, the vocabulary, language and idiom of the finished book of Jonah comes from a much more modern time - roughly the end of the 4th century BC - some 400 years later. We don't know who the author of the book is. The book bears Jonah's name because he is the chief character, not because he is the author. The writing is concise, sharp and satirical. Jonah is the main character, but he is not the hero - he's the object of examination and there's a great deal of fun being poked at him. Judging from the linguistic clues mentioned earlier, we can conclude that the book is about Jonah and was written at a time where it was felt that readers could learn lessons from Jonah's mistakes and also get to meet Jonah's God. At the end of the day, the main character isn't Jonah, but God. Jonah is, in many ways, a foil for God - Jonah's mistakes and misconceptions show God in a clearer light. There is a lot of humour in the book and this too is a beautiful picture of the playfulness of God that is in no way callous or unkind, but desperate to break through our calcified preconceptions. 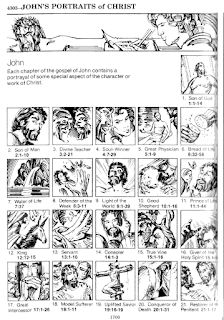 EmmDev 2015-08-14 [John's Portraits of Christ] 21. Restorer of the Penitent. 21. Restorer of the Penitent. When they had finished eating, Jesus said to Simon Peter, "Simon son of John, do you truly love (agape) me more than these?" "Yes, Lord," he said, "you know that I love (phileo) you." 16 Again Jesus said, "Simon son of John, do you truly love (agape) me?" 17 The third time he said to him, "Simon son of John, do you love (phileo) me?" Peter was hurt because Jesus asked him the third time, "Do you love (phileo) me?" He said, "Lord, you know all things; you know that I love (phileo) you." Peter had failed - horribly. So now, a couple of days after that initial encounter on Resurrection Sunday, Jesus once again spends time with Peter. It seems that although Jesus had specially met with Peter, (and we can only assume He pronounced forgiveness and peace to Peter) the time had come for Jesus to reinforce Peter's forgiveness and restoration. We've all heard a sermon on the different Greek love words that Peter and Jesus use. Twice Jesus uses "agape" and Peter answers "phileo" and so the last time Jesus uses "phileo". Commentators debate and warn us not to be too dogmatic about it, but at the very least, we would have to say that "agape" seems to be a higher and more pure form of love than "phileo" which seems second prize to "agape". Jesus comes to restore Peter, to reinstate him, to heal him of the self-imposed exile he has placed himself on. "If you love me - even if your love is imperfect - feed my lambs, take care of my sheep, and feed my sheep." This is what Jesus came to do. To restore us and make us new. We're not perfect yet, but we're doing His work. I can think of no more beautiful way to end John's gospel. That brings us to the end of this series on John's Gospel. Please take a moment to share what the series has meant to you. What have you learnt about Jesus? I'll summarise and send it out at the end of next week. 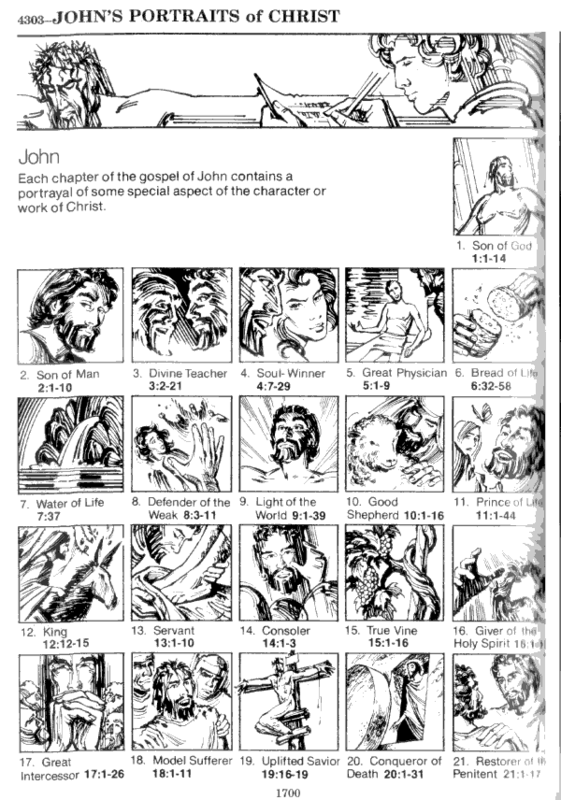 Below I've included the picture from the Thompson's Chain Reference Bible that inspired this series . Remember you can go to http://emmdev.blogspot.com/ to see past devs. The EMMDEVs will take a break next week and re-start on the 27th. Please send me suggestions for the next series. The word still gives me butterflies in the my tummy. It quickens my pulse when I proclaim it at funerals. If comforts me when I stand at a deathbed. It is the current that "lurks in the wiring" waiting to jolt me when I unexpectedly touch it. But here in John 20 the Conqueror of death does an incredible thing. Mary has come to the tomb and found the stone rolled away. She has run to the disciples to tell them. Peter and John have run to the tomb and gone inside. John believes. Peter doesn't know what to think. Mary wonders around the garden devastated and broken-hearted. Jesus meets her but she doesn't recognise Him. He's conquered death, defeated sin and triumphed over Satan. But she can't see it. But then He speaks ONE WORD to her and she sees. On that day when I close my eyes for the last time on this earth and I open them again in a new world. I know Who I will see. I know what I will hear. I will see HIM - the conqueror of death, sin and Satan. I will hear Him say MY NAME. So the soldiers took charge of Jesus. 17 Carrying his own cross, he went out to the place of the Skull (which in Aramaic is called Golgotha). 18 Here they crucified him, and with him two others--one on each side and Jesus in the middle. John has a unique perspective on the crucifixion. This perspective is revealed in the phrase "lifted up" - a phrase that Jesus uses of Himself more than once. (See John 3:14; 8:28 & 12:32) The cross, in John's perspective, is not a tragedy, but a triumph. It is the crowning point of Jesus' life and purpose - this is why He came, this was what He came to do and this is where He triumphs. In John's theology, Jesus came down to earth in incarnation, humbling Himself, in His teaching and healing He was exalted and the lifting up began until He was lifted up on the cross for the world to see. (In John 12 He says "But I, when I am lifted up from the earth, will draw all men to myself") He will continue His journey up in Resurrection and Ascension and the sending of the Spirit. So the cross is significant - it is the highpoint of Jesus life and ministry. This moment that we consider tragedy is, in fact, a triumph. And Jesus cries out "It is finished." (In Greek the word is "Tetelestai" and indicates a debt paid in full or a jail sentence fully served. But even as we sing "Hallelujah" let us also bow our heads, the victory came at a terrible terrible price - the sinless Lamb of God suffered - really suffered - and died - really died - for us. 5 "Jesus of Nazareth," they replied. "I am he," Jesus said. (And Judas the traitor was standing there with them.) 6 When Jesus said, "I am he," they drew back and fell to the ground. 7 Again he asked them, "Who is it you want?" This chapter always fills me with awe. John doesn't portray Jesus as a helpless victim. Jesus isn't rendered powerless by the soldiers, He isn't just a statistic in Pilate's court roll for the day. He isn't being dragged inevitably to the cross. Instead we see Jesus taking charge of each situation - He is not being dragged - He is deliberately moving toward the cross. Jesus goes out to meet the soldiers. They don't get to shout "Freeze! You are surrounded! Drop your weapons!" Instead Jesus asks them who they want. When they identify that it is Jesus they want, Jesus answers and in the Greek it is literally "I, I AM He." The connection to the other "I AM" statements in John and to the holy name of God given to Moses at the burning bush is clear. What happens next would be comical if it wasn't so downright awesome and incredible: The entire detachment collapses on the ground! Jesus asks them again and negotiates the release of the disciples. When Peter chops off the high priest's servant's ear we expect chaos to erupt. But Jesus controls the situation and even Peter is released! Go and read the rest of the chapter. Jesus is in control. He is majestic and in charge. With the Pharisees and with Pilate. Not a victim - but a willing sacrifice. Not dragged to the cross but deliberately headed there. Some theologians have described the Trinity as a Perichoresis: "A joyful choreographed dance around the centre." Imagine the Father, Son and Holy Spirit in a creative whirling dance of life spinning and moving so quickly and fluidly that the individuals fade together in the beautiful act that is the dance. John 17 has our Saviour, who is about to face a torturous God-forsaken death, at prayer. What does He have on His mind as He prays?? He's thinking about us and praying for us! And what does he pray for? That we may join in the dance of the Father, Son and Spirit in the perichoresis of life. That just as Jesus and the Father enjoy the intimacy of the dance of life, that we too may be drawn into the music and choreography of moving and working together so much so that others are attracted to and drawn in as well. Jesus in the Father, and us in Him, dancing so that the world sits up and pays attention. This is what Jesus thinks about as He prays in Gethsemane and it is for this that He goes to the cross. Jesus is continuing this very intimate "death-bed/last-words" conversation with the disciples. In this chapter He alludes to the incredible idea that He will return to the Father in heaven in order that He can send the Holy Spirit into our hearts. His work is complete - He will have obeyed the Father in everything. This makes the Gethsemane "not my will but Yours" so important. He has paid for the sin that has separated us from God. He is now the High Priest who doesn't have to sacrifice bulls and goats because He gave the perfect sacrifice of Himself. But the good news doesn't end with Jesus' return to the Father... Having returned to the Father, Jesus will send the Holy Spirit into our hearts and lives. The phrase Jesus uses for "Counselor" is "Paracletos" which means the "One who comes/walks (kletos) beside (para)." This is an incredible promise: This is the final step of what the prophets Jeremiah and Ezekiel foresaw when they spoke about hearts of stone being replaced with hearts of flesh and about the knowledge and love of God being written on our hearts. Jesus, the glorious majestic Son of God, comes from heaven to earth, to pay for our sin, to close the gap between us and God so that He can send the Holy Spirit into our hearts. No longer is it legalism - trying to work from the outside-in - now Jesus makes it possible for God to work from the inside-out.